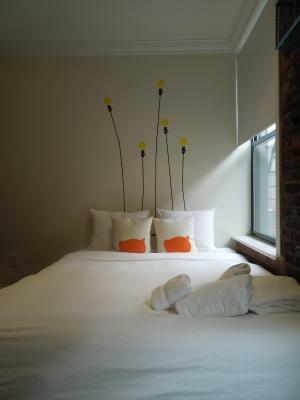 Lock in a great price for East Village Hotel – rated 8.1 by recent guests! No elevator was tough...on the 4th floor. Otherwise good.. I like the fact that it is small and intimate. I love the East Village so I should change to I love the location. Friday night; noisy outside. I come often, but I think the value for the dollar is pretty relative. I might need to check out other places. Perfect location ... great vibe ... all you need inside AND on the block outside. Easy walk to great eats and beverages , casual and fine dining . 20 minutes to Brooklyn via train ... Love this spot. 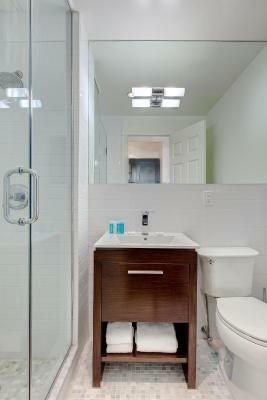 The location is great, the room was very clean and functional. Nice to have small coffee maker & coffee supplied. 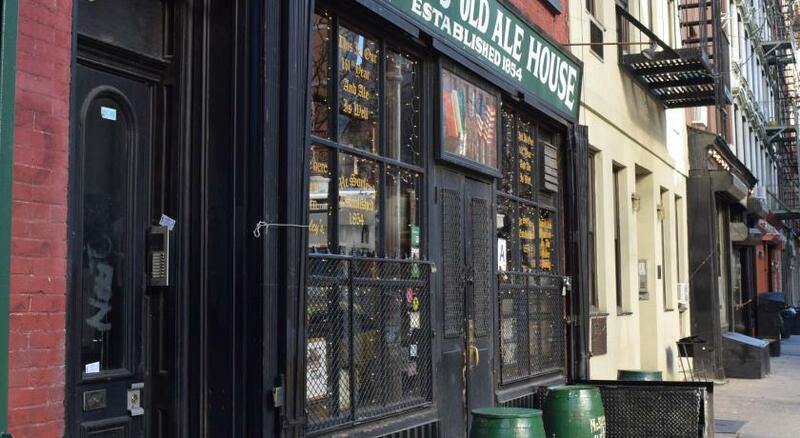 The hotel is located in an excellent location in East Village. 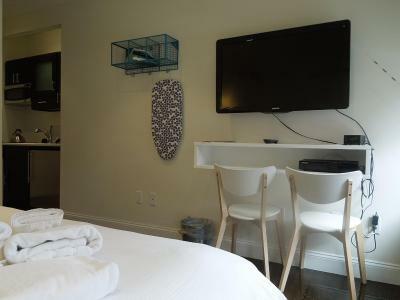 The studio apartment was clean and the staff were polite and accommodating. The room was exceptionally clean. The bed was clean and comfortable. We asked for housekeeping each day and we're very pleased. Desk was manned morning to evening, the employees were all friendly. Location is fantastic. Great economy accommodations. Great location. Great price, great coffee shop downstairs. Only down is it’s a little noisy you definitely need ear plugs if you’re used to hearing nothing at night. Second time staying here (coming and going overseas). Fantastic neighborhood, walking is easy to great food, Parks & venues. 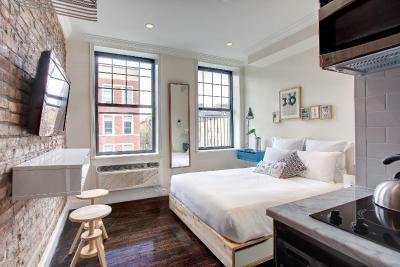 Would stay next time in NYC. Very cute & comfortable! Location & coziness!! Perfect area for walking & delicious food! Kind, friendly staff! 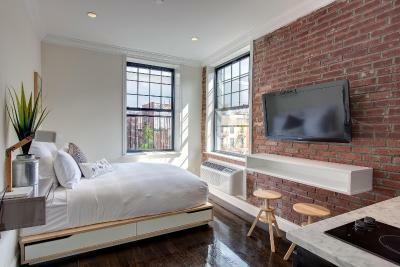 Great room with beautiful exposed brick walls. Not your typical hotel room!!! 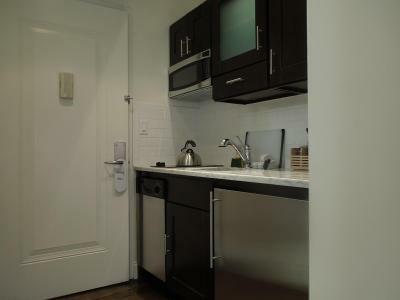 Small kitchenette with stove, fridge, dishwasher, dishes, free coffee-perfect to save money in New York. 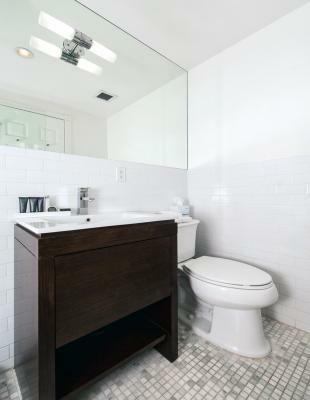 Close to great restaurants and coffee shops. Close to public transit. Loved it!!! 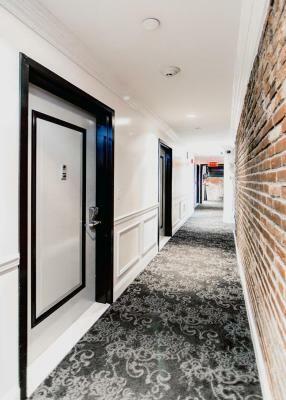 East Village Hotel This rating is a reflection of how the property compares to the industry standard when it comes to price, facilities and services available. It's based on a self-evaluation by the property. Use this rating to help choose your stay! One of our best sellers in New York! 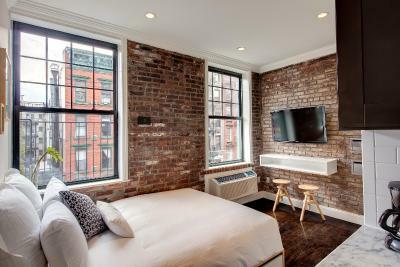 Located in Manhattan’s East Village, this hotel is surrounded by restaurants, bars, and night life. 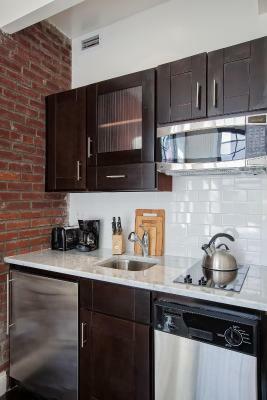 The studio apartments boast free Wi-Fi access and a kitchenette. 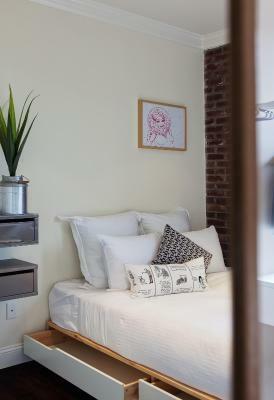 Each guest studio of this private residence offers queen size bedding, stainless kitchen appliances, including fridge, stove, dishwasher, and microwave, as well as all necessary utensils and cutlery. 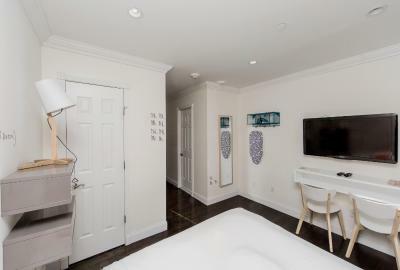 A 40" flat TV with premium channels, coffee/tea maker and private bathroom with complimentary toiletries complete the accommodations. The front desk offers concierge services and there is an on-site coffee shop/café. Dry cleaning and laundry services are also available. 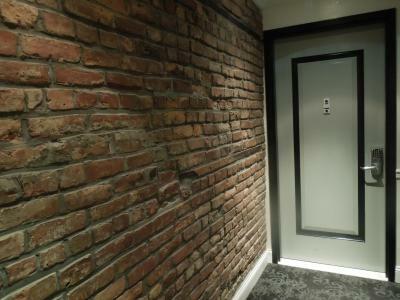 The East Village Hotel NYC are accessible only by stairway. A coffee shop, The Bean, is on the ground floor of the hotel and the popular bar, Coyote Ugly, is just steps away. 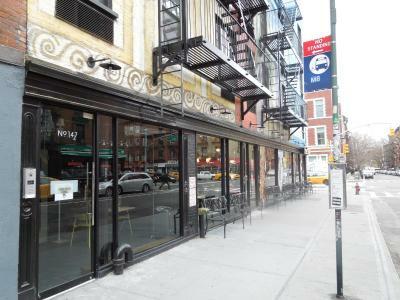 Momofuko Noodle Bar and Iggy’s Pizzeria are within easy walking distance. The Astor Place underground station is less than 10 minutes’ walk from the hotel. Times Square is 15 minutes’ underground journey away. 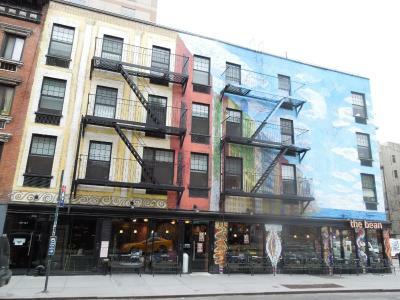 East Village is a great choice for travelers interested in food, restaurants and museums. When would you like to stay at East Village Hotel? 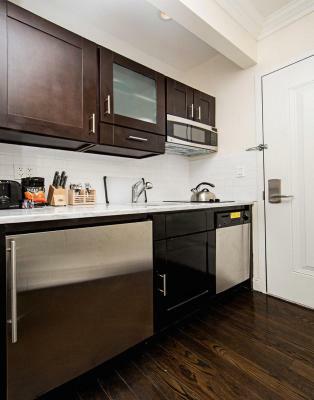 This studio features a kitchenette and a flat-screen cable TV. 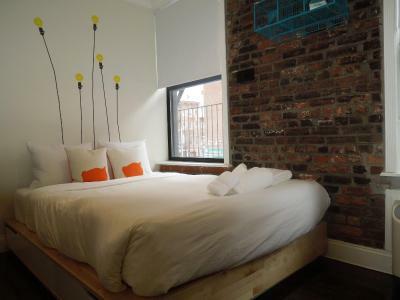 The East Village Hotel is a modern boutique hotel featuring studio style rooms and full kitchens with all appliances. We strive to be our guests' favorite home away from home. 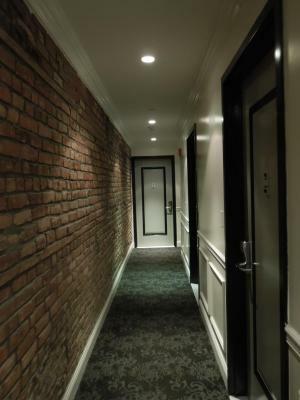 The hotel is located in a 3 flight walk up brownstone building that will add the feel of a true NYC experience. Complimentary Wi-Fi is available to all guests throughout the building. Hotel surroundings – This neighborhood is a great choice for travelers interested in food, restaurants and museums – Check location Excellent location – show map Guests loved walking around the neighborhood! 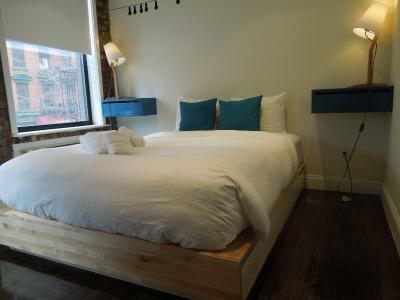 House Rules East Village Hotel takes special requests – add in the next step! East Village Hotel accepts these cards and reserves the right to temporarily hold an amount prior to arrival. Guests can book same-day arrivals until 21:00 and must present a credit card upon check-in. Please inform East Village Hotel of your expected arrival time in advance. You can use the Special Requests box when booking, or contact the property directly using the contact details in your confirmation. Outside noise is very loud, but not sure what can be done about that. Location was excellent. Reception assisted swiftly when needed assistance. I thought it was rather pricey. The room backed onto the road and so was quite noisy throughout the night. I have bad knees and my room was on the 3rd floor. With no lift it was hard carrying luggage up and down the stairs. The room was clean, fresh and spotless. The bed was super comfy. The kitchenette was well stocked and brand new. It had a good range of implements and complimentary coffee which was appreciated. 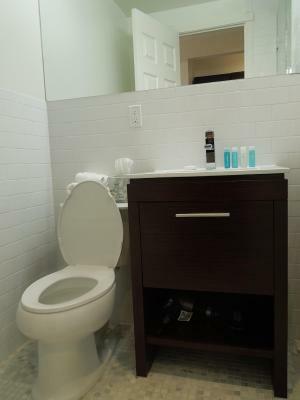 The bathroom had a large range of complimentary toiletries which I was grateful for. Staff were on hand for the majority of each day in the lobby and it was great to be able to leave luggage on my last day so that I could make use of my final few hours in NY. It seemed a safe area. Lots of delicious eating places just a few steps away. I come often, but I think the value for the dollar is pretty relative. I might need to check out other places. There was a bulb out in the bathroom and they didn't have any shampoo. It is not a big deal but for the cost, it seems like they could have just put a sample size shampoo in the room for us so we didn't have to go get some. 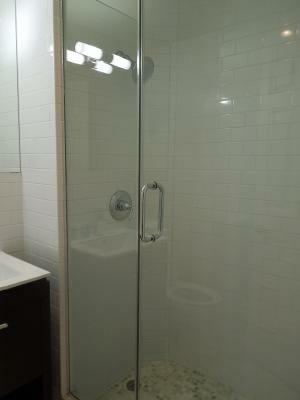 No place in shower to put soap or shampoo. A few small details need tlc. Broken towel bar, only one hook on door. Minor stuff like that. Oh and expect it to be noisy most all of the time - you are on busy 2nd Avenue in the East Village. You better expect noise! The hotel is in a great part of the city with lots of restaurants and bars within walking distance. 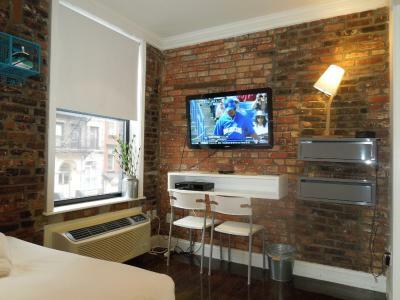 The room is a decent size for NYC. Check in process was super easy (all done prior to arrival). The rate is competitive and good value for money. The cleaner was very enthusiastic however has a tendency to knock on our room very early to clean our room 6. 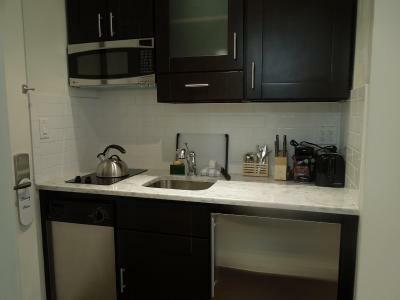 The kitchenette was sadly missing utilities and when u did cook you were always subject to the smoke alarm. There was no comfortable seating area in the rooms or lobby, if you are in the room the best option is to lie down in the bed. No desk where I could sit to work. 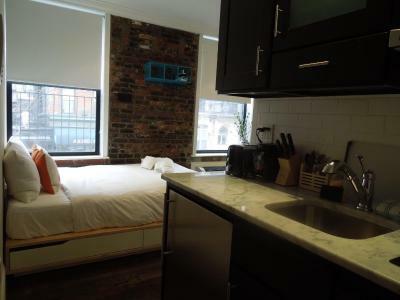 Great location in New York's East Village. 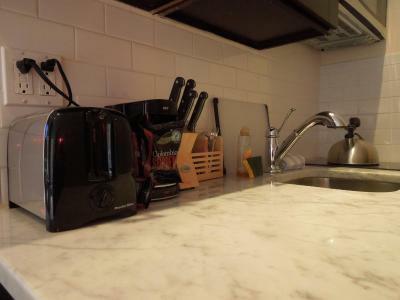 Glad to have a kitchenette.